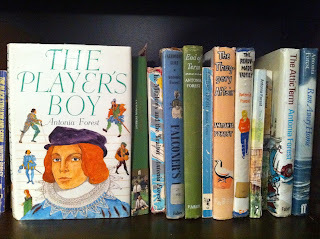 Having introduced Antonia Forest's The Player's Boy and its sequel, The Players and the Rebels, a few posts ago, I found myself at a bit of a loss as to where to start when writing about them. As my regular readers know, I'm not a disciplined reviewer - I don't tend to do a straightforward synopsis, followed by my thoughts. My writing about books is rather more tangled than that! I did a bit of trawling online to check out the availability of these books currently, as, at the time I acquired them, they were few and far between, and very pricey when they did appear. Both of mine are the original hard copy editions, with dust jackets, ex-library, and in excellent condition. One I managed to source from a seller here in Australia, the other was bought via an international auction from a UK seller. I am not going to disclose what I paid for them because I've never told anyone. Suffice to say, they never leave my home. I'm more than happy for people to read them, but they'll have to either take up residence for the duration or read them in installments during visits! ...still shocked by the terrors of the past night, rightly fearful of the man mounted behind him - even so he was enchanted to see it was true that in London, unlike his own distant Westbridge, houses spanned the river: and his much-tried courage rallied: even if, as might well be, this day should prove his last, he'd at least set eyes on one of the wonders of the world. The narrative then moves back three weeks to a Friday afternoon as Nicholas and his good friend, Sam, barrel out of the confines of the Grammar, running for the market place and the local carrier with whom they will get a ride home for the weekend. Nicholas lives with his brother Geoffrey, a yeoman farmer and his wife Kate at the family farmhouse, Trennels. Their father, a recusant Catholic in Protestant England, is dead, as is their older brother, Lawrence. Their mother died at Nicholas' birth. Initially, their weekend begins as usual until, on Sunday afternoon, chasing Sam's hawk into the gardens of the neighbouring Merrick grounds, they overhear Anthony Merrick (of an openly practicing Catholic family) discussing what could be seen as possible treachery. Shaken, they emerge when it safe to do so and make their way to their respective homes. Nicholas discovers they have an unexpected guest, one Christopher Marlowe, poet and self-confessed government spy. He is stranded at Trennels when his horse casts a shoe, and despite Kate's lack of enthusiasm to entertain a guest when she is very pregnant and not wishing to be seen, Geoffrey offers hospitality. In the course of the evening, the discussion becomes contentious, tempers are lost and following brief fisticuffs between Geoffrey and Marlowe, Geoffrey bets Trennels against Nicholas' ability to recite a whole page of text after a single sighting. Possessing a photographic memory, Nicholas succeeds and humour is restored. However, it sets the tone for the events to come. Nicholas oversleeps the next morning, missing the carrier's cart back to the Grammar, but Marlowe offers to take him. Apprehensive about the consequences he will face arriving back so late for classes. Marlowe offers him, almost as a dare, an out, suggesting they meet at midnight and he, Marlowe, will take Nicholas with him so he can, effectively, take some time out... Nicholas thinks little of it at the time, horrified at the thought of doing a runner. However, things go from bad to worse at the Grammar. First, he's in trouble for being late. Then, because he's not thinking, he exposes what's been going on for years; that he's been doing Sam's work for him - Sam being no scholar. Sam is expelled, and Nicholas is soundly whipped. But it gets worse - in the yard during lunch, he is caught by the head master asking a question of a junior master that is judged to be heretical. The junior master is sacked, Nicholas is sent home - to the head master's home where he boards, where he later hears of the potential consequences that now await him. Mulling things over, he decides to take up Marlowe's offer. Marlowe, it turns out, is to appear before the Privy Council, on charges of heresy - which are dismissed, but during the celebrations afterwards with his associates, he is killed in a brawl. Nicholas, who has been introduced as his cousin, is left to the mercies of Robin Poley, government spy, who agrees to take him to London to Marlowe's patron, Harry, the Earl of Southampton - an associate of the Earl of Essex. He charges Nicholas, on pain of death and sworn on a crucifix, to spy on the Earl and bring any information he can to him. When, later, the Southampton is looking for a way to employ Nicholas in his household, Nick's singing voice becomes known and he's offered the post of singing boy - at which point, he tells of Poley's charge, and begs not to be part of the household. He's handed over to the Earl's hawk keeper for the time being, and then eventually, Harry Southampton hands him over to his other poet, William Shakespeare, to become his 'lad' - an apprentice player. Thus begins Nick's new life as a player. In order not to arouse unnecessary suspicion, Shakespeare decides - still believing Nick to be Kit Marlowe's cousin - that he should be introduced to the company as Nicholas Arden, his own cousin. This is also in order not to violate the apprentice laws of the time which required apprentices to be related to their masters. Nick learns on the job while the company are touring the countryside - the theatres in London being closed due to plague - starting with non-speaking roles. Returning to London when plague is declared gone, Shakespeare is accosted by Richard Burbadge of The Chamberlain's Men, a company formed by his father. Burbadge invites them both to join the company - Will, primarily as a playwright, although he will, as all the company members do, take roles as needs must. Nick finds he has much to learn - the standards of the company being much higher than that required on the road. He is given the most basic roles - bringing props on and off the stage while in costume, but learning to efface himself while doing so; non-speaking roles when he has to appear to be 'listening intelligently'; then to his first speaking role as Clarence's son in Richard the Third. Then one day, when one boy comes in rather the worst for wear after a big night, and clearly can't go on, in the sequence of roles being passed down through the understudies, it comes to Nick to play Edward, Prince of Wales. It turns out that he does well enough for better parts sooner than expected when the same boy who messed up is dropped from bigger parts altogether. Meanwhile, Nick's friendship with Humphrey Danvers, Harry Southampton's page, continues and the boys, without telling either of their masters, meet on Sunday mornings when they can. Humphrey is a bumbling, untidy boy, a gifted musician, but not at all suited to being a page. As Will is now part of the Chamberlain's men, he has no need of a patron, and is well suited to not being caught up in a faction that includes the Earl of Essex, whose designs on the throne are well known. Usually he enjoyed dining at the Burbadges, partly because Mistress Burbadge was a good cook, partly because he like the cheerful tumult and babble of little Burbadges on either side of the table. But today when his plate was handed to him, he sat and looked at it, not even pretending to eat; and Burbadge said, "Hanging's worse." "Then you'd better find another craft," said Will. ... He knotted the lace and stood up. Most of the candles had been blown out, but there were enough to see by as he hurried down the room; and then, as he neared the door, a girl came towards him from a room beyond - a slight, graceful creature in a silvery gown, fair hair under a jewelled caul, grave steady eyes, an air both proud and shy - a haunting face; O, she doth teach the torches to burn bright. He stood aside to let her pass, as she did the same for him: forgetting his dress, he bowed politely, and gestured her to come on; as did she. It took him an instant longer to realize he was looking into the Venetian looking-glass at the end of the room. So that was how they'd see him. A phoenix-fire sprang in his heart, making a bonfire of his fears. He gave himself a last admiring look, swept himself his best curtsey, and went up the stairs to discover the Great Chamber ... and the rest of the company just where he'd been told he would. This last quote is one of my very favourites from the book. Nick goes on to give an entirely creditable performance and life goes on. Eventually, there comes a time when, due to a sequence of events, it becomes clear that he must tell Will the whole story of who he is. Will is, understandably horrified, saying that he'd never have taken him had he known - he'd have delivered him back to Trennels, as would have Harry Southampton, had he been told the full story. In the first indication Nick gets of how things must play out for him as a player's boy, Will makes him promise to go home when his voice breaks - as he will not be able to continue as a player until his voice 'mends.' Unwillingly, he makes the promise, being entirely unwilling to contemplate either the reception he might get or the idea that he will have to leave the company, even if it is only for a while. Nicholas is, of course, an entirely fictional character while many of the others are not. Forest is able to give full license to the development of his character, where with the historical figures, she must have had to exercise some degree of caution. However, the book itself doesn't read as if she struggled with this aspect of bringing actual people back to life many centuries later. All the characters, whether real or invented, interact with each other seamlessly, and the ins and outs of the daily lives of a theatre company during this tumultuous period of history are beautifully realised. I strongly recommend that, if you have a love of good historical fiction - and I wouldn't hesitate on the basis of this particular book having been written for children - try and lay your hands of a copy of this novel. At the time of writing, there are some copies available on Amazon. As the originals were only published once, any hardcover you can buy will be a first edition. The paperback versions are reprints by specialist publishing company Girls Gone By, who, with permission from author's estates and original publishers, are putting out new paperback editions of a whole range of out of print children's books. Don't be fooled by the cover illustrations - they have sought and been given permission to use the originals in their editions. They are good quality books - I have some from another series. It's really more about what you like to have in your bookcases. Your biggest problem, if you can get a copy, will be that by the time you read it, you will want the second one - but that will be for another post!